The family of a US marine dog handler who died in Afghanistan has adopted the canine that served alongside him. Janus, a police dog from the West Midlands who has managed to capture and secure over 400 criminals during his career, will be resting his paws as he reaches the age of nine and a half. Some dogs just love to be with their owners, no matter what they’re doing. Dogs are happy sitting on the sofa while you watch TV, sitting on your feet under the table while you eat and sitting in the car while you drive; so long as they’re with their owners, they’re happy. 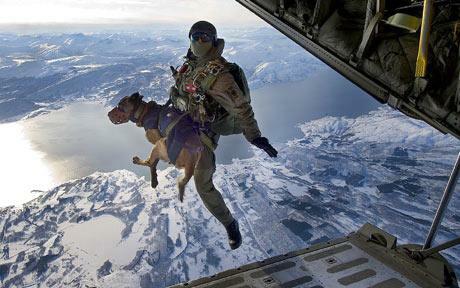 One dog in Norway, a Belgian Shepherd, has taken this theory a little too far when he went on a parachute jump with his owner, but at least they are both in the army – the Austrian special forces to be precise. The dog is a special sniffer dog, trained to detect explosives and save lives, and his owner is a paratrooper who is training with the British Royal Marines. What do puppy’s facial expressions mean?